is clear, but you can't see it from this POV. A small "traffic jam" on the cycle-path. Utility cycling holds up in the winter because due to the lack of ice on the cycle-paths it is nearly as easy to cycle on a day like this as it is in the summer. We've added two new front lights to our selection. The Union UN-4268 has a very boring name, but it's a great light. 35 lux with a well shaped beam from a curved reflector at under €20 is pretty much unbeatable. But this light also has automatic switching dependent on light level (optional and intended for use with hub dynamos) and a powerful standlight which keeps it running for minutes after you've stopped. The Basta Sprint headlight remains less expensive, but it's got a lower output than this one and doesn't have the other advanced features. The second new light is completely different. The Philips Safe Ride Pedelec is a top of the range light which combines the 80 lux output of the same company's internally battery powered light with the smaller size of their excellent 60 lux dynamo light in a product designed specifically for use with pedelecs. If you have a pedelec with less than impressive lights, there's no better upgrade on the market than this. The "motorcycle performance" comes from two high power LEDs and the best optics available which together reach 60 m without blinding oncoming cyclists or drivers. Another thing that I like about this light is that the included mount can be used for other applications than pedelecs. In fact, it's perhaps the best possible light now available for mounting externally on velomobiles. Even the included bracket can be turned around to works for this application as you see in the attached photo. Some DIY is needed to use the Philips Pedelec light. You have to supply both power and switching. However, this is made easy by the incredibly wide range of input voltages on which it operates - anything between 6 and 48 volts DC will do, meaning that almost all bicycle power supplies either for motor assist or for velomobile lighting, whether they're based on NiMH, Lithium or even old-school Lead Acid batteries are suitable without any extra circuitry being required. Finally, this is of course nothing to stop you running this light on a normal bicycle used for commuting or touring. The 80 lux internal battery light from Philips provides much the same performance, but you can achieve longer running times from the pedelec light if you provide a larger battery. You can find both lights directly by following the links above, or by browsing in our webshop. Mountain bikes and racing bikes have narrow saddles. The reason for this is that they are ridden in a bent forward position. Your weight is spread between the handlebars and your legs as well as on the saddle and you need a degree of freedom for comfort and to avoid chafing. However, if you ride a more upright bicycle your weight is supported much less by the handlebars and more by the saddle and your legs are in a different position relative to the rest of your body. This is also true if you convert a mountain bike to achieve a more comfortable and more upright position. While changing the stem and handlebars, don't overlook the importance of changing the saddle. 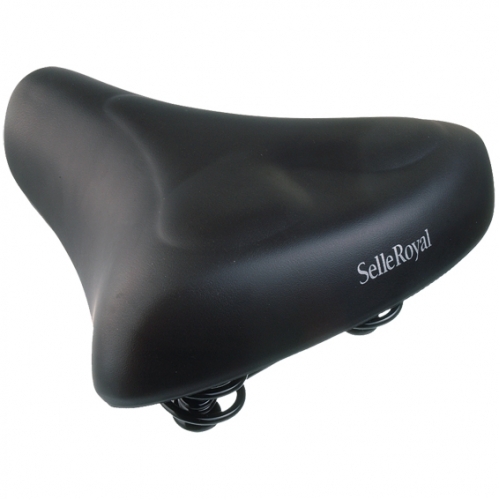 For a long time, we sold just one type of saddle at DutchBikeBits.com - the Selle Royal 8261, as shown on the left. This is a good everyday saddle for most people. It has a good shape, it's not overly wide, it has a little sprung suspension for extra comfort and we use it on almost all of our bicycles. What's more, this saddle comes at a very reasonable cost, it lasts many years of everyday use and it has an advantage over some more expensive saddles that some people overlook - it's made of plastic. What ? Plastic saddles are better ? If you want to ride your bike more than maintain then yes indeed they are. Plastic saddles do not need to be guarded against the weather as do leather saddles. If they get wet, you just brush off the wetness and they're dry again. Also, there is nothing to rub off and stain clothes, even when they are wet. That's why I find this to be the perfect saddle for riding everyday. However, I'm not everyone. My wife, Judy, was never quite completely happy with the 8261. After some time spent deliberating, she decided upon a Selle Royal RoyalGel women's saddle as shown on the right. This is a softer saddle with a more sculpted form than the 8261 and it is specifically designed to suit women who want to ride upright. Judy now rides daily with this saddle, which apart from the different design has the same features as the 8261 which I and the rest of our family use. We don't sell everything and we don't seek to sell everything. Rather, we sell those products which we believe in. It is only after Judy had ridden on her new saddle for several months that we took the decision to increase the range of saddles that we sell. The exact model of saddle that Judy chose was discontinued a year after this blog post was written. We now recommend the Manhatten saddle for a similar level of comfort, or the more unusual nose-less Rok design. See also our anatomy of a reliable, everyday bicycle. What size of wheel and tyre is used on my bicycle ? Choosing the right size of tyres for your bike can be difficult due to competing methods of measurement. 47-406: A "20 inch" tyre. Bicycle tyres come in a bewildering array of different sizes. It's absolutely vital to buy the correct size for your bike. While tyres are mostly made of rubber, the most important dimension when fitting is that of the bead of the tyre, and this is reinforced either with steel wire (for most tyres) or with glass or other fibres (for folding tyres) so that the tyre won't stretch and come off the rim when fully inflated. For this reason, bicycle tyres do not stretch and even sizes which are very close in size are not interchangeable. In the past, wheel sizes were usually described as the outer diameter of the size of the wheel including a nominal inflated tyre. In countries which used imperial units these would be expressed as a size in inches (e.g. "26 inch" or "28 inch") while in metric countries the size was expressed in millimetres (e.g. 700 C or 650 A). you are best off ignoring this old "size"
This system would work just fine if each size of wheel was described by a different number. However, that was not so. As an example, the "26 inch" wheel size used on traditional British bicycles is a lot larger than the "26 inch" wheel size used on traditional American bikes. British bikes were for many years imported to the USA, and when Mountain Bikes became popular, they brought the American wheel size to the UK. What's more, there are more "26 inch" wheel sizes than just these two. There are also two different sizes of "28 inch" wheel, one of which is larger and the other smaller than the "27 inch" size. "29 inch" wheeled mountain bikes actually use the same diameter rim as the smaller "28 inch" size, so these two use smaller wheels than "27 inch". The same problems arise with smaller wheels as well. The two most commonly used "16 inch" wheel sizes are both considerably smaller than 16 inches in diameter. The largest of the two measures just over 13.5 inches in diameter, while the smaller is nearly 2 inches smaller than this. There are also several different wheel sizes referred to "20 inch". The metric versions of these measurements also cause confusion. A 700 C wheel is not the same size as a 700 B wheel but it is the same as one of the "28 inch" sizes, even though it's neither 700 mm nor 28 inch in diameter. Inevitably, there is much confusion about wheel sizes. In 1964, the European Tyre and Rim Technical Organisation was formed. They're an organisation that few people have heard of, and I know little of what they've been doing for the last 50 years except that they've given cyclists a great gift in the form of a system for identifying tyre and wheel sizes which guarantees compatibility. This has been standardized internationally in the form of ISO 5775, but most people still refer to these figures as "ETRTO numbers". The "ETRTO number" consists of two numbers separated by a dash. The first gives the width of the tyre, while the second gives the diameter of the rim which it fits. For instance, 37-622 indicates that a tyre has a width of 37 mm and is to be mounted on a rim of 622 mm diameter. This is the most common size for Dutch town bikes, and is also a common size for touring bikes everywhere. Before buying a replacement tyre, inner tube or wheel, first check the writing on the side of your existing tyre and find the ETRTO number. To help you find an exact match which will work on your bike, all the tyres and inner tube as well as the wheels in our web shop are listed with their available ETRTO sizes. You do not always have to buy the same width of tyre as you had before. While it is not a good idea to fit a very wide tyre onto a very narrow rim, nor a very narrow tyre onto a very wide rim, in principle any tyre of any width will fit on any rim which is the correct size. In practice we suggest not going too far from what the manufacturer of your bicycle fitted. For example, if you currently have 32 mm wide tyres, then fitting a 37 mm wide tyre instead will likely give a bit more comfort. However, make sure you have enough clearance in the frame and under mudguards for a larger tyre size. It is not possible for a bicycle tyre to "aquaplane" because speeds are too low, and pressures are too high. Therefore, a profile is not needed on bicycle tyres to increase grip in the wet. When on a hard surface (concrete, asphalt), grip comes from the tyre deforming over small sharp edges in the surface, not from the surface deforming to fit the tyre, for this reason, a complete slick tyre provides all the grip you need on such a surface. What's more, a tyre which has a tread pattern will generally have a higher rolling resistance due to deforming of the tyre as you ride along. For this reason, a completely slick tyre (like the Kojak) would serve most people well most of the time. However, tread on a tyre is useful in some circumstances. If you sometimes ride on unfinished paths, mud, sand and snow, then a slight tread pattern is useful because the surface will then deform around the tread and provide extra grip. It is for this reason (as well as that new tread patterns look good in marketing materials) that most general purpose tyres have a slight tread. A more extreme tread pattern is needed for more extreme circumstances. 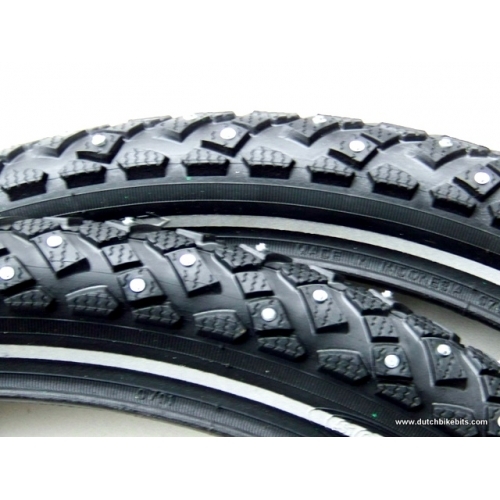 Those who do cross country riding or mountain biking on rough paths benefit from an aggressive tread, and of course this becomes more extreme in examples such as the Marathon Winter which go as far as having metal studs to pierce through ice. It is important to maintain correct tyre pressures. While it can be It is more common that people run their tyres at too low a pressure than too high. If the pressure is too low then too much of your energy goes into deforming the tyre as you cycle, and this makes cycling considerable less efficient. If you can easily deform a tyre with your fingers then it is almost certainly under-inflated. All bicycle tyres run at higher pressures than car tyres, and car pumps are often not capable of achieving high enough pressures for a bicycle. Narrower tyres need higher pressure than wider tyres. The racing bike tyre on the left has a recommended pressure between 6 and 10 bar (85 to 145 psi), while a wider mountain bike tyre may need just 2 to 3 bar (30 to 45 psi). Narrow tyres may damaged quite quickly by too low a pressure, while some tyres (notably the Schwalbe Marathon) have been reformulated to make them more resistant to damage due to low pressure. For everyday use, a thumb test (if you can deform the side-wall of the tyre with your thumb, pump it up) is enough for most people. However, we also stock the very good Schwalbe digital air pressure tester for people who want to make sure their tyres are at a suitable pressure. We also sell a range of pumps suitable for getting your tyres to a suitable pressure. Note that with tyres with puncture resistant layers, like the Marathon Plus, if you try to test the pressure by squeezing the running surface of the tyre, all you'll "test" is how soft the anti-puncture layer is. It's important to do this on the sides of the tyre, squeezing between thumb and forefinger. 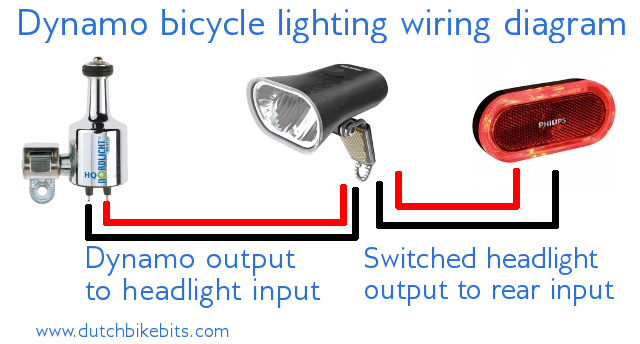 (or... everything we know about dynamo lights for bicycles). Much nonsense is written about dynamo lights. The objections usually come from people who don't use dynamos, or have not used them for many years. According to some "experts", dynamos either slow you down or wear out your tyres or don't produce much light, make noise, or perhaps they commit a combination of these sins. Actually, modern dynamo lighting is efficient, reliable, quiet and produces so much light that the best headlights now have optics which shape the beam to prevent those coming in the opposite way from being dazzled. It's low cost in use as no batteries need ever be bought. It's reliable for day to day use as there are no batteries to go flat and have to be charged or replaced. Dynamo lights are permanently mounted on the bike, meaning you don't have to detach things and take them with you when you park your bike. Permanent mounting also means your lights are always there. An unexpected delay doesn't result in cycling in the dark with no lighting. There is quite a lot of power available to run lights from a dynamo so dynamo lights can be very bright. Because the power source is you, your lights stay bright even on long rides. They can't fade out half way home because the battery ran out. Dynamo lighting is a "fit and forget" option. Set it up properly once and ride with the minimum of maintenance thereafter. While no good quality dynamo will slow you down by enough to make a difference unless you're in a race, hub dynamos offer lower drag when the lights on are than bottle dynamos do. However, because bottle dynamos completely disconnect from the wheel when the lights are out, bottles offer no resistance when you are not using the lights, while hub dynamos still have a small amount of in-built drag relative to a normal well-maintained hub. Hub dynamos cannot be knocked out of alignment, and will continue to work well even if your wheel is damaged and the rim bent. However, bottle dynamos do not need to be replaced if you damage your wheel and have to replace it. Hub dynamos are heavier than bottle dynamos. Bottle dynamos can slip in the wet (meaning your lights can be unreliable) though this is rare with correct setup. Hub dynamos cost more to retrofit because you must buy or build a wheel. However, they don't require brackets to be fitted to the bike and the wheels probably don't cost as much as you think. Bottle dynamos are much more straightforward to retrofit to a bike which already has hub or disk brakes or to a rear wheel with hub gears. While hub dynamos are produced for specific wheel sizes (most are intended for 26" or 28" wheels and will produce more drag when used in a smaller wheel size), bottle dynamos are unaffected by wheel size because they operate on the sidewall of the tyre and are not affected at all by wheel rotational velocity. lighting set. We don't sell these. this, see our guide below. We sell both bottle and hub dynamos. We've used both types over the years. At the moment, most of our own bikes are fitted with bottle dynamos. Our favourite bottle dynamo is the Nordlicht. This is made of metal, robust, very reliable and light running. We're still using one that we bought 15 years ago. A lot of quality for something so inexpensive. We also rate the AXA HR which is a little less expensive and perhaps runs slightly lighter. We also have a range of wheels with Shimano hub dynamos. These start at under €90. Very good value for what you get. Very nearly all currently available dynamos, whether hub or bottle, have the same output of 6 volts at 3 Watts to power both front and back lights. 2.4 W is allocated for the front light and 0.6 W for the rear. Just a few models of hub dynamo produce 6 V 2.4 W making them suitable for powering just the front light. This means that all dynamos are compatible with any available dynamo lights and you can mix and match to achieve a combination which has the performance and price that you want. Even the cheapest all in one set has the same output, so even if you have started with a set like this, you can swap one component at a time for those of better quality until you have a satisfactory lighting setup. There's just one thing to bear in mind with headlights - with a hub dynamo you want either a manual or automatic light sensing switch on the headlight so that you don't run the lights even in daytime. This switch will also operate the rear light. Oh, and something I must point out about having 2.4 W for the front lights. This is quite a lot of energy for bicycle lighting. Most battery lights of old used 0.75 W front bulbs as higher power led to very short battery life. Contrary to many people's opinions, dynamo lights were always brighter than battery lights. While some high end battery lights available these days are brighter than dynamo lights, many battery powered lights still do not attempt to produce so much light as even low cost dynamo headlights do, because trying to do so results in a short battery life. In days of old, dynamo lights used sometimes incandescent bulbs. These were often used with reflector designs which spread the light too broadly and could result in a not very effective light pattern. Halogen bulbs improved the situation considerably as they increased the light output for the same power, and better reflector shapes helped even more. However, they were never quite adequate for fast cyclists. The introduction of LED headlights has changed everything. 2.4 W (the headlight share of the 3 W output of a dynamo) is enough to produce a considerable amount of light from LEDs. Also, LEDs last and last and last. There is no need to replace bulbs. Even at a low price, modern dynamo LED headlights work extremely well. At the mid and high price ranges they become yet more effective. An important advance is shaped lenses and use of indirect light from the LED source. This has made it possible to build extremely bright lights with a sharp cut off at the top which won't blind oncoming cyclists and drivers. It also means that more light goes where it is needed for you to see by because less is wasted in the wrong direction. AXA Luxx 70 plus - ( €70 ) Enormous light output. When you're not using the light, this also provides a USB outlet to charge mobile devices. Busch und Muller Cyo Plus - ( €60 ) The same 70 lux output as the AXA, but with a better lens and without the USB outlet. B&M IQ Fly T - ( €60 ) Provides daylight lighting which some people like for additional visibility during day time. Union / Marwi UN-4268 - ( €17) a low cost bargain of a light with excellent performance, using a similar reflector pattern to the more expensive Busch und Muller lights. A 35 lux LED output with standlight is excellent at this price. Includes a switch so can be used with bottle or hub dynamos. For hub dynamos there's also the option of an automatic function. B&M Lumotec Lyt - ( €17 ) a lower cost option from Busch und Muller. Not so bright as the UN-4268, not such a good beam shape and no standlight at this price, but it does have the Busch und Muller name behind it. Includes a switch so can be used with hub or bottle dynamo. AXA Sprint 10 lux - a much lower cost light. In fact, a bargain at just €15. It's not so bright as the Union, B&M Lyt or the more expensive lamps, but still well in advance of what was available ten years ago and still entirely adequate for riding in town where there are street lights. Optional switch and stand light functions. "standlight" feature which means they stay lit when you stop. Dynamo rear lights have also been revolutionized by LED technology. It made it possible to have a "stand light", where the light would charge up and store electricity so that it can continue to glow after you stop cycling. With rear lights, there are other factors to consider, such as where you will mount the light. Some rear lights are designed to mount on the rear mudguard (fender) while others are designed to mount on the rear rack. Busch und Müller Secula Plus ( €20 ) - Excellent small light which spreads the light from its LEDs to increase visibility while not creating an unpleasant ultra-bridge hot-spot which blinds cyclists behind you. Options for mounting on the rear mudguard or on the seat-stay. Busch und Müller Toplight Line-Plus ( €25 ) - Excellent quality bright rear light which spreads the LED output sideways to avoid blinding others. Busch und Müller Toplight Flat ( €13 -) a more economical but still nicely made rear rack mounting light. Finally, note that running the rear light from the dynamo is optional. You can also use a dynamo front light together with a battery rear light. Some people prefer this due to not having to run so many cables along their bike. We have battery rear lights to use together with dynamo lights which can be mounted permanently on the bike. 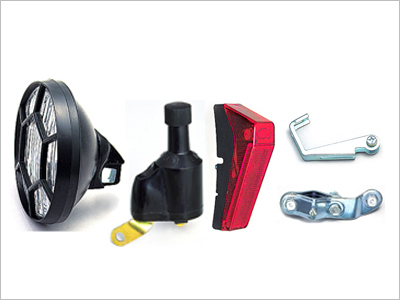 As well as the main parts of dynamo, front and rear light, there are other parts that you will probably need. Some lights come with wire, but not all. You will probably need wire to attach between the dynamo and headlight or between the headlight and rear light. We sell wire fitted with the correct size of push on connector for our lights. You can use zip-ties and/or electrical tape to run the wires along the forks and frame of your bike. We have inexpensive zip-ties but do not currently sell tape because you can almost certainly buy it as cheaply as we can in a discount store near your home, and you may be able to find colours which are a good match to your bike. If using zip-ties, which we recommend you do, please don't do them up so tight that you cut through the insulation of the wire. Also, remember to leave a little loop of wire around the headset so that the handlebars can be turned without putting undue stress of wire which is heading to the rear lamp. rear wheel, Canti / V brake boss. If fitting a bottle dynamo to a bike which doesn't have a bottle dynamo mount on the frame or fork, you will need to buy a bracket. Of these, we think the Cantilever / V brake mounting bracket works best, so if you have mounting points for these brakes, whether or not they are in use, this would be our first choice. Like most things we sell, we use it ourselves as you can see in the first photo on this page. While the electricity from the dynamo is AC, it is still important to make sure that you keep the "earth" connection consistent through the wiring of your lights. The reason is that the "earth" is connected to the frame of the bike within both the dynamo and some of the lights. Confusions over "earth" can lead to faults such as the switch on a headlight not actually switching off your lights because electricity is flowing through the frame of your bike, or the lights either being very dim or not lighting at all due to a short circuit through the frame. The "earth" side of each light and dynamo is made obvious by labels on each component. If unsure, use the wiring diagram. The black wire in the diagram denotes the earth connection. The outside of the wire does not of course have to be this colour. With the wire that we supply, both are black but the earth wire has a white stripe along it. When there is no switch on a headlight, the input and output are the same. Just connect the wires from the dynamo and to the rear light together at this point (doing it this way makes it easier to change to a different headlight at a later date). Not all bottle dynamos work in an identical manner, but it is usually the case that you press a button of some kind to release the spring to allow the dynamo to push against the wheel to switch the dynamo on and pull the dynamo gently away from the wheel until you feel a click to switch back off. track on the side of the tyre. Run the dynamo on a tyre with a dynamo tread and make sure that the dynamo is aligned so that it runs correctly along that tread. Skinwall racing tyres are not designed for use with a dynamo and the sidewall of such a tyre could be damaged by using a dynamo against it. All the tyres that we recommend for everyday use have a dynamo track on their sidewall. However, if you prefer skinwall tyres, note that the Nordlicht dynamo can be run on the rim, which makes it compatible with skinwall tyres. Take care of correct pressure against the sidewall of the tyre. I find that setting up the dynamo so that in the "off" position it is about one cm clear of the tyre works best. You may find that this varies a little with different combinations of tyre and dynamo. Note that when you change between different tyres of different widths this distance may need setting up again. To adjust the gap between the rubber or steel roller of the dynamo and the tyre you can bend the brazed on bracket until this spacing is correct. If the gap is too wide or too short then it may result in there being inadequate pressure. Your correct distance may not be the same as mine. Excessive pressure results in more drag and can also sometimes result in the dynamo slipping. The Nordlicht dynamo with rubber wheel can also be set up to run on the rim. The same rules apply. of the wheel is important. The dynamo axis must be lined up so that it passes directly over the centre of the wheel. Not doing this will roll out the roller on the dynamo more quickly than normal and can even damage bearings in the dynamo. Slipping can occur if the roller is worn out. Replacement rubber rollers can be bought in our shop for both the AXA and Nordlicht dynamos. In both cases you simply pull off the old one and push the new one on to replace it. Bent wheels result in intermittent lighting behaviour because the dynamo stops operating as the low point comes around. Solving this problem requires either a new wheel or rebuilding of the existing wheel. Minor problems can sometimes be solved by tweaking with a spoke-key. Loosen spokes on the side which is convex, and tighten adjacent spokes by the same number of turns on the side which is concave. A squealing noise from the dynamo quite possibly means that the internal bearings are worn out. It's usually accompanied by much more drag and can result in intermittent light. This happens quite quickly with some cheap dynamos, and is aggravated by incorrect setup with the axis of the dynamo not going past the centre of the wheel. If your dynamo has reached this point, you may well need to replace it. A better quality dynamo will last longer than a cheap one. However, before you dispose of the old dynamo, try applying some light oil, just a couple of drops, to the bearings. You may need to remove the roller to do this. If the dynamo is old, but still in good condition, it may simply have dried out. Periodic noises: If a noise occurs roughly twice or three times a second with a bottle dynamo setup, this is caused by the wheel, not the dynamo. Wheels on bicycles rotate roughly two to three times a second at a normal rate of cycling. A warped wheel, a defect on the tyre or other problems with the wheel can cause slipping or jumping of a bottle dynamo at the frequency of wheel rotation and can make quite a lot of noise. If you experience this problem, turn the wheel slowly and watch for defects. This article is quite long because I've tried to cover everything. However, setting up dynamo lights isn't difficult to do. Once it's been done, you have "free" lighting with lights which are permanently attached to your bike and cannot be easily stolen (you need tools). A great bonus for utility cyclists, as you don't have to carry things with you when you leave your bike. For some kinds of sport cycling, for example road racers who want to carry absolutely the minimum of weight and be able to easily remove their bikes for daytime racing, or night-time mountain bikers who want enormously powerful lights which flood the entire area in front of them with light1, there is no real choice but to use battery powered lights. For the rest of us, dynamos really are the best option. Q: Do bottle dynamos wear the sidewall of your tyre ? A: No. The roller has very little pressure compared with that of the bike on the road so wear on the sidewall of the tyre is very much lower than that of the tyre against the road surface. Normally you will notice no sidewall wear of significance in the lifetime of a tyre. You should, however, only use a sidewall dynamo on a tyre which has a dynamo track printed on it. Q: Can I use a dynamo with a small wheeled bicycle ? A: Hub dynamos are designed to operate at a particular rotational velocity. Most are designed for 26" to 28" wheels (see our blog post about wheel sizes). If fitted to a smaller wheel size they will generate the same amount of electricity at a lower speed and create more drag. Bottle dynamos operate against the tyre or wheel rim. This moves past the dynamo at the same speed as the road surface moves past your bicycle. Wheel size doesn't matter at all for bottle dynamos. They are equally efficient on a small wheel bicycle as on a larger wheel bicycle. Q: What happens if I go too fast ? A: In the past it was not uncommon for fast riders, especially when cycling downhill, to blow light bulbs in older style dynamo lighting. This is no longer a concern with modern LED dynamo lights. Similarly, use of a hub dynamo on a small wheel, even when cycling downhill, is unlikely to cause a problem. Bottle dynamo users who are concerned about this issue can install a larger diameter roller on their dynamo which reduces output at higher speeds and also reduces drag. Q: Do bottle dynamos slip in the wet ? Q: How much does a dynamo slow you down ? A: Almost not at all. I wouldn't expect to be slowed by more than 1/20th of my normal speed by a well set up quality bottle dynamo when the lights are on. A hub dynamo will slow you even less and of course when lights are off there no no drag from a bottle dynamo and very nearly none from a hub. The stronger you are, the less the effect can be felt. Q: Which dynamos keep the lights glowing when you stop ? A: None of them. This function is always in the headlights and tail-lights themselves, and it's present in all of the rear lights and almost all of the front lights in our shop. Q: Don't the lights go out when you stop ? Q: What happens if I use a headlight without a switch on a hub dynamo ? A: The lights will come on whenever you ride your bike, even in the daytime. Some older hub dynamos were actually more efficient with the lights on than with them switched off. However, this isn't true for the hub dynamos that we sell now. It's better to have a switch. Q: If I have an old dynamo lighting set and one component has failed then do I have to buy everything new again ? A: Almost all dynamo lighting sets ever made are rated at 6 V 3 W. If yours has this rating (it's usually written on the bottom of the dynamo) then it is safe to substitute any of the front lights, rear lights or dynamos that we sell and use them in any combination with older parts for the same system. Q: I have an old Sturmey Archer Dynohub. Can this work with modern headlights ? A: The original Sturmey Archer Dynohub had a slightly lower rating. 6 V 2 W. Headlights expect 6 V 2.4 W. This means there isn't enough output to run a normal headlight at full brightness. However, in practice, the combination of one of these venerable dynohubs with a modern LED headlight will result in much more light than you ever could have produced with the original lights which matched the dynohub. It is best in this case to use a battery rear light so that all the energy from the dynohub goes to the headlight. Modern "dynohubs" produce 6 V 3 W and can run both front and rear lights. Q: Where is the best place to buy good quality dynamo lighting ? A: The Dutch Bike Bits webshop, of course. 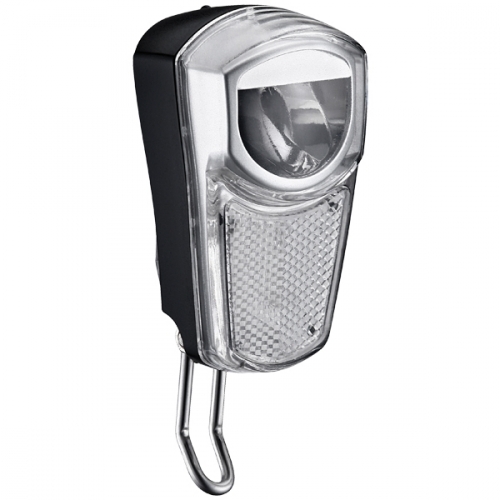 We also have a wide range of battery lights if you would prefer them. Q: Why can't you use just a dynamo rear light without a front light ? Sources of electrical power can approximate either a constant voltage or a constant current. Constant voltage: A battery is an example of a constant voltage source, and it will attempt to supply the same voltage whatever load is attached. If you short-circuit a battery, then the battery will attempt to discharge at an infinite current and this is why lithium batteries, which are capable of very high currents, can cause fires. Constant current: A bicycle dynamo is an example of a constant current source. Bicycle dynamos are rated at 6 V 3 W but what this really means is that they are current sources which attempt to deliver half an amp across whatever load is connected. The expected load of a rear and front light together is the equivalent of 12 ohms. A dynamo tries to supply sufficient voltage always to deliver the same current. With a short circuit, the dynamo will still deliver about 0.5 A at zero volts, but with an open circuit the dynamo will produce so high a voltage as it can in an attempt to deliver 0.5 amps. The 12 ohm equivalent resistance for front and rear lights together comes from the front and rear lights being connected in parallel. The front light has an equivalent resistance of 15 ohms while the rear light is the equivalent of 60 ohms. To combine the two we use 1 / (1 / 15 + 1 / 60) = 12. Now that we know the equivalent resistance of each light we can calculate the current and power for each if used on their own. For a front light alone, V=IR, V=0.5 * 15 = 7.5 V. P = IV, P = 0.5 * 7.5 = 3.75 W. This is a little over the rated value of 2.4 W, sufficient to damage older front lights with bulbs unless the bulb is changed to 3 W. However, modern LED based front lights can cope. For a rear light, V=IR, V=0.5 * 60 = 30 V. P = IV, P = 0.5 * 30 = 15 W. This is a long way over the rated values of 0.6 W and 6 V and this is why dynamo rear lights do not last long if connected on their own to a dynamo. The front light is required to keep the voltage down to the correct level for the rear light. 1Please don't use mountain bike type lighting when you're not in a mountain bike race. It's anti-social and potentially dangerous to other road and cycle-path users who can be blinded by the amount of light scattered too high in front of you. It's analogous to driving a car with the headlights on full beam. The lights that we recommend here, especially the Philips lights, are very bright while being specifically designed to avoid this problem.